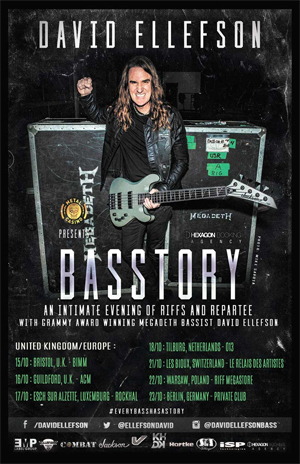 MEGADETH Bassist DAVID ELLEFSON Announces European Dates For His "BASSTORY TOUR"
Grammy Award Winning MEGADETH bassist, author, entrepreneur, and Metal Icon David Ellefson, in association with Hexagon Booking, has announced a string of European dates to his BASSTORY tour, a series of limited and exclusive "Storytellers" dates, starting 9/21 in Portland, OR, USA. *Private events. No public ticketing available.